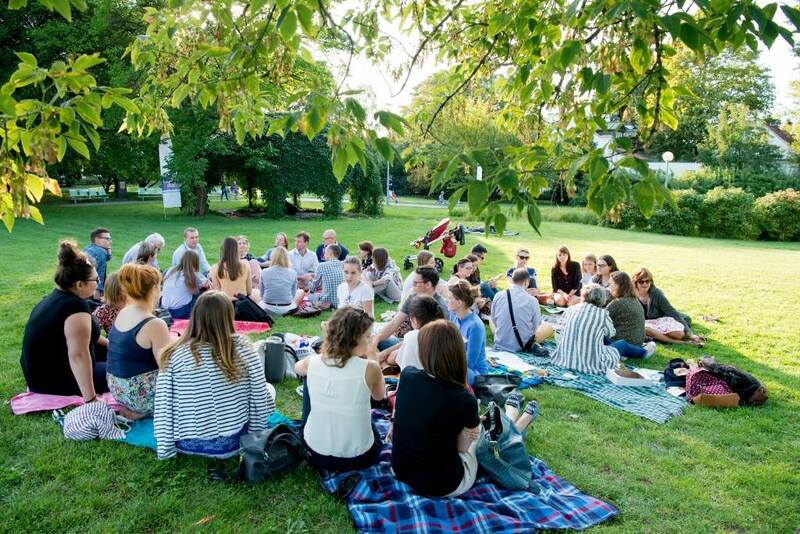 In an effort to get out of the office on hot summer days, we at Translators Family decided to go outside and organise a picnic for translators and translation agencies. We hoped it would be one of those rare occasions when translators in Warsaw could meet up in an informal environment. Happily for us, interest in the event was overwhelming. Up to 400 people expressed interest in attending, with around 50 actually making it on the day. Those who came were extremely complimentary about the event and many said that they wished there could be more of such events. This is a short account of what took place on that day in late August. We chose a tranquil spot in the garden of the University of Warsaw library, which is always a great place for a stroll or a picnic for (book)lovers. We had a pre-arranged agenda made up of two main parts: a networking session and a discussion of hot topics affecting the translation industry. 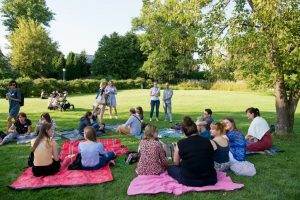 The networking part was simple enough, with every person giving a short five-sentence introduction at the beginning and having the chance to mingle freely on the grass at the end. For the discussion part, we had many topics on our list but we finally decided to stick to just two topics for this event. We put several blankets on the ground to split the participants up, with a team leader on each one (a manager from Translators Family). Each group discussed the same two topics: firstly, whether the profession of sworn translator in Poland is prestigious, and secondly, why neural machine translation is still not widely used when it has proven to be such a great tool. To become a sworn translator in Poland, it’s necessary to pass a complicated state exam. We had several sworn translators at the picnic who confirmed that only 20% of all applicants usually pass this exam, a fact which goes to show just how prestigious the profession is. One of the English-to-Polish sworn translators explained that the exam is difficult, but the texts are quite standard for a well-prepared translator used to translating legal documents. Several other attendees agreed that the documents for sworn translation can be pretty standard, making the work profitable though not particularly creative. To the question of whether or not it’s worth trying to become a sworn translator in Poland, many replied that it is worthwhile because it gives you respect as a proven and reliable translator. From my own perspective, I added that when I first came to Poland to expand my translation business here, I started by looking for sworn translators to join our translation team. I believed that by passing such a difficult exam, they had proven that they would be valuable people to work with. Unfortunately, the rates for sworn translations in Poland, especially for popular languages, are quite low in comparison with specialist translations such as marketing or technical documents. But again, the level of repetition in the documents for sworn translation more than makes up for that. Overall, around 90% of the attendees agreed that the profession of sworn translator in Poland is prestigious. 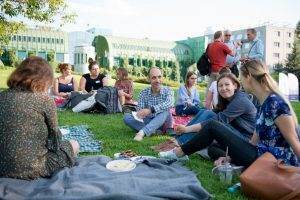 But, as another sworn translator pointed out during the picnic, what makes it even more attractive is that, despite the ever-increasing threat to our profession from machine translation, there will always be a need for human sworn translators with a stamp and legal authority. When we moved on to the issue of machine translation, we had an illuminating and insightful discussion on the topic. Almost 70% of the attendees, mostly freelance translators, either did not know or had only a vague idea of what neural machine translation actually is and what makes it so unique. They also claimed that they’d never used any machine translation in their work. In contrast, the owners of the translation agencies who were present (of whom there were several there besides myself) were very well aware of what neural MT is and the benefits it brings. Surprisingly, there were no comments that we shouldn’t use machine translation because of the negative impact it could have on our profession. Most agreed that we can’t escape from technology nowadays and that it will soon be like it was with CAT tools: we will either have to accept it or remain on the outside. Of course, the number of human translators will decrease, but the best specialists will remain, especially in the more creative fields such as transcreation. Only 47% of all the attendees correctly identified the human translator; 50% mistook the DeepL translation for the human one, and a mere 3% believed it was the one done by Google Neural MT. The latter gave itself away somewhat when it incorrectly translated the legal form of our company written in Polish within the English text. “Translators Family Sp. z o.o.” therefore amusingly became “Translators Family ogród botaniczny” (turning us into a botanical garden, instead of the abbreviation simply being left as it is). If it hadn’t been for this blunder, however, Google’s work could easily have been mistaken for having been done by a person. To sum up, the attendees were very happy that NMT is not yet widely used. At least the freelance translators were. But most of them agreed that we should all remain open-minded so as not to miss the boat. Rather than resisting modern technology, they said, we should try to harness it in order to stay afloat. Luckily, after these potentially disheartening conclusions, we then had another opportunity for more networking. And that’s just one more reason why it’s good to be in this wonderful profession – the fact we can share it with so many great people. So let’s try to keep the human element of this profession, but at the same time embrace the technological advances that can make our lives easier. By Oleg Semerikov, General Manager, Translators Family sp. z o.o.